Hanoi (VNA) - After the opening of Japan’s first 7-Eleven store in Vietnam in June, the Republic of Korea (RoK)’s GS25 convenience store chain has official announced its intention to enter the market, reported online news website ndh.vn. The entry of GS25 makes it the first Korean brand to join the fierce competition of the Vietnamese convenience store market. 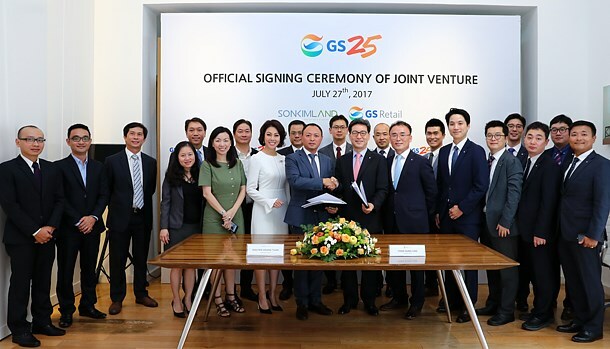 GS25 and Vietnamese Son Kim Group have formed a joint venture which will be in charge of operating local GS25 franchises in Vietnam. Accordingly, GS Retail, the convenience store chain’s parent company, holds a 30 percent stake in the venture, while Son Kim holds 70 percent. GS25 is expected to open its first store in Ho Chi Minh City by the end of this year and has set a goal of opening more than 2,500 stores within the next 10 years. GS25 is one of the RoK’s largest convenience stores, accounting for about 30 percent of the retail market in the country. Previously, Son Kim Group has co-operated with GS Home Shopping since 2012. GS Home Shopping and GS Retail both belong to the GS Group. According to the most recent data on the retail market in Vietnam, total revenue reached 118 billion USD last year, a year-on-year increase of 10.2 percent.